BIG FINISH: "With our ability, there is no stopping us," says Hind, pictured with 2018 national champions Ackeilia Wiltshire and Chris Binnie. 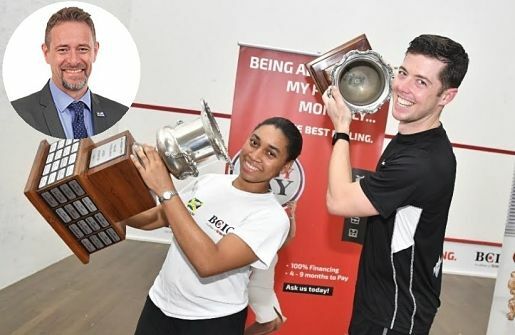 THE Jamaica Squash Association capped a fantastic year with the successful staging of the BCIC-sponsored All-Jamaica Squash Championships at the Liguanea Club in New Kingston on the weekend. A sizzling men’s final match-up between Bruce Burrowes and Chris Binnie provided a super-strong finish. Association president Chris Hind was in the stands beaming with pride as the players’ adrenaline soared and the crowd roared with each exciting play. In a TALLAWAH exclusive, Hind reflected on the past 12 months and what the future holds. TALLAWAH: Star boy Jonathan Walker, who represented us at the Youth Olympics, is not competing at this tournament. What happened? Chris Hind: Unfortunately he is away and couldn’t come back in time. He’s now at college in Massachusetts. But he’s still heavily involved with our national programme. 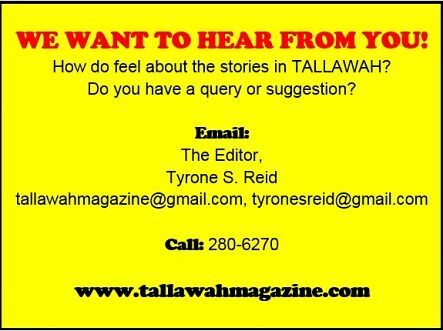 TALLAWAH: Good to hear. 2018 was such a big year for squash in Jamaica. Are you satisfied? Chris Hind: It was an excellent year. A lot of accomplishments to celebrate. We hosted the junior CASA tournament, which was a massive success. We had over 300 guests and about 120 players. The place was absolutely rockin’. Some of the representatives from Trinidad said it was the best tournament they had been to in a long time. Also, we got bronze at the PanAm Games, and Chris Binnie has been charging up the international ranks. He’s been doing really well. All in all, it’s been a very productive year. TALLAWAH: As you mentioned, Binnie continues to do exceptionally well and seems guaranteed another Sportsman of the Year nomination. What has been the key to his success? Chris Hind: Dedication, hard work, lion heart. If you get a glimpse of his training, it’s like watching a Navy Seal in action. He’s very committed to the sport, and he’s very proud to represent Jamaica on every team. TALLAWAH: As president, what do you hope squash achieves locally in 2019 and beyond? Chris Hind: We want to get more youngsters playing. Once we have them in the programme, with our speed and fitness as Jamaicans, we’ll move from being a Caribbean power in squash to a world power. The best is yet to come. With our ability, there is no stopping us. TALLAWAH: That said, what is the key to the future growth of the sport in Jamaica? Chris Hind: Just spreading the word, dipping into the inner-city a little bit to recruit some young talents and getting more kids involved. We also need to maintain our sponsorships. BCIC has been our sponsors for this tournament for the past few years, and they are a great partner for squash. That’s the kind of support we need.